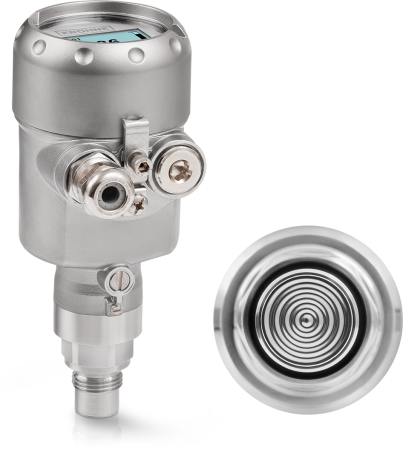 The OPTIBAR PM 5060 is a pressure transmitter for process pressure and level measurement in hygienic and non-hygienic applications with gases, liquids and steam. It can be used in open tanks and – as dual version for electronic differential pressure measurement – also in closed vessels. The pressure device features a piezoresistive or a strain gauge metallic diaphragm. Depending on the measuring cell, the pressure transmitter can operate over a wide process pressure range from 100 mbar / 1.45 psi up to 1000 bar / 14500 psi. The OPTIBAR PM 5060 can be provided with or without standard silicon oil fill fluid as well as FDA approved oils for hygienic applications. The flush process connections allow for hygienic and crevice-free installation. The pressure device can be used up to operating temperatures of +105°C / +221°F, special versions even allow for up to +200°C / +392°F without separate diaphragm seals.